September 2018 - Read. Think. Act. 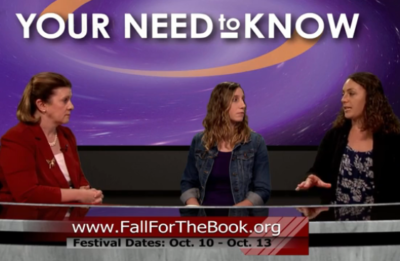 (Sept. 26, 2018) Catherine Read interviews Suzy Rigdon-Williams and Kara Oakleaf, professors at George Mason University (GMU), about the upcoming Fall for the Book Festival. This is the 20th anniversary of the four-day event, featuring over 150 authors. It will run from October 11th-14th on the GMU campus. Planning for this event goes on all year, and Rigdon-Williams and Oakleaf are enthusiastic about the variety and breadth of authors and genres that are being featured. During the planning phase they work closely with the festival partners, including the Fairfax County Public Library and professors from George Mason University, to make sure that they know what books are currently popular. This helps them shape the festival and provide relevant programming for patrons. A few of the headliners include Tayari Jones, author of The American Marriage. This is a best seller that is being read and discussed by many book clubs. This book portrays the relationship of an African American couple when the husband is falsely accused of a crime and sent to jail. Congressman John Lewis will make an appearance to discuss his recently released graphic memoir entitled March, that documents his life story and his role in the civil rights movement. Author Paul Hawkins will speak about his book Drawdown, which outlines practical ways to mitigate climate change. The schedule of all of these authors, along with the 150 others, can be found on the Fall for the Book Website. There is also a special app that can be downloaded to help patrons organize their schedule during the festival. Rigdon-Williams and Oakleaf note that one of the most exciting aspects of the festival is that they are giving their students first hand access to the authors. Student can learn about how an author completes the writing process and where they get their inspiration. Each and every writer goes about the creative process in their own way, and it is helpful for the students to understand this. For many of the students, it is the first time that they have had access to this type of forum. This exposure can be invaluable to young students who are considering embarking on a writing career. Saturday October 13th will be community day for the book festival. They are partnering with the city of Fairfax during their Fall for Fairfax Festival, and will have activities and events for people of all ages. The Old Town Hall will feature arts and crafts and special story times. There will be free parking on campus, as well as shuttle buses that will be running back to the downtown area, so people can easily access the activities. They encourage everyone to explore the schedule and come by to hear about a topic of interest. Sadly, the closing event featuring Angie Thomas who wrote The Hate U Give has to be rescheduled. Stay tuned for information on the the Fall for the Book website, along with social media, to find out when she will be coming back to discuss her best selling book, which was just released as a movie this month. Catherine Read will be moderating the panel “Surviving as an Outsider” on Saturday, Oct. 13th from 1:30 – 2:30 in Merten Hall. Joseph Cassara, author of The House of Impossible Beauties and Patrick Nathan, author of Some Hell, will be discussing the concept of outsiders as it relates to the LGBTQ community. (Sept 24, 2018) Catherine Read interviews Kofi Annan, President of the Fairfax Chapter of the National Association for the Advancement of Colored People (NAACP). They discuss the goals and accomplishments of the local chapter. 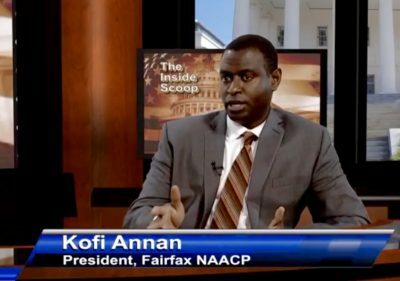 Annan is excited to enter the second year of his presidency of the Fairfax chapter of the NAACP. Several years ago, when racial tensions were rising, he decided to join the chapter in order to help affect positive change in the community. He quickly made a mark, and was encouraged to run for a leadership role. His background is in military service, and had never dabbled in the policy arena, but was excited for the challenge. The chapter has been very busy under his leadership, and he hopes to continue to make a mark in the community. He and his wife reside in Herndon, where they are active members of community and are raising their two sons. Annan, along with his staff and volunteers, has been engaged in the community efforts to ensure equality for all. His first big accomplishment included a change to the Drivers Education curriculum. The program is now required to include a presentation by a police officer that talks about how all drivers should interact with the police if they are pulled over. This is an important addition to the curriculum, and helps young drivers to know how to appropriately handle this situation in order to stay safe. Setting realistic expectations helps everyone stay on the same page, and can help avoid misunderstandings which can ultimately cause fatal problems. Following their success with the Drivers Education curriculum, Annan chose to address inconsistencies that he noted with School Resource Officers (SROs). When reviewing data regarding SRO write-ups, he noticed that 60% of the SRO referrals happening in Fairfax were for students who are of African American or Latino heritage, even though those students only make up 30% of the population. When digging further into these incidents, they noticed that many of the referrals were for behaviors that should have been handled administratively through the school, not through the SRO. After taking the data to the School Board and the Board of Supervisors, as well as raising awareness in the media, all parties were able to work together to pass a new policy. The policy is aimed at reducing the number of SRO referrals and arrests through the justice system, and encouraged SRO’s to work collaboratively with the school to try and resolve issues proactively at a local level. Annan mentions the fact that all parties were willing to come to the table with an open mind, along with ideas of how they could improve the process, allowed them to craft a policy that made sense for everyone. The local chapter has also been heavily involved with the renaming of JEB Stuart High School in Falls Church. Several years ago, a group of students came together to protest the fact that the school was named after a Confederate General. These students took their issue to the School Board, with the help of their local NAACP chapter. They ultimately succeeded in their goal, and recently had the official naming ceremony of the new Justice High School. The entire process took approximately three years from start to finish, and Annan found it rewarding to see it come full circle. In 2018, the Fairfax chapter of the NAACP was recognized for all of their hard work when they were granted the prestigious Thalheimer award. This national recognition was given at the annual NAACP conference in San Antonio in July. Annan was thrilled that his chapter was recognized for all of the hard work that they are putting in to make Fairfax County a more welcoming, fair and equitable community. Annan and his team are currently working on several other important initiatives, including forming a curriculum subcommittee and a group to address criminal justice reform issues. The curriculum subgroup will look at what history is taught to our kids, and how it is taught. The goal is to incorporate different perspectives and viewpoints, as much of our history is taught from an Anglo-American perspective. As for criminal justice reform, there are two main areas that are being addressed. First, the NAACP will be working together with Fairfax County Police regarding implementation of body cameras for all police officers. They are embarking on a pilot program this year, and are working closely to make sure that there are good policies surrounding the use of the cameras and the data that they will yield. They want this process to be transparent, and for all who are interested to be able to weigh in on the process. The other program that will be getting their attention is the Diversion First program. Implemented in 2016 under the leadership of Sheriff Stacey Kincaid, this program is designed to help officers focus on de-escalation of criminal situations in low level crime situations. This program offers alternatives to incarceration for people with mental illness or developmental disabilities. The goal is to have the police officer intercede whenever possible to provide assessment, treatment or needed supports. Annan is working with the justice system to make sure that minorities are being diverted at the same rate as white people. His goal is to ensure that the policy is effective across the board and all are being treated equally. Annan is working hard to make the NAACP attractive to young people. They have an event planned on September 29th called Justice in the Park. The program will feature a panel of adults, including an author, a police officer, a representative from the Juvenile Justice System and a school representative, and will be moderated by the students. There will be free food and an opportunity to engage on a variety of levels. Looking ahead, Annan has several other engagement opportunities available for those in the community. There will be an Affordable Housing Forum and a Job Fair on October 2nd, a Veterans and Minority owned Business Expo on December 15th, and a Women in the NAACP event on November 8th. He encourages all who are interested to participate in their monthly meetings, held on the 2nd Saturday of every month (check the website for location). Elections are coming up in November, so it is an ideal time to get involved. 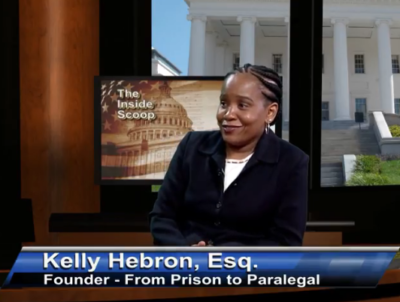 From Prison to Paralegal with Kelly Hebron, Esq. 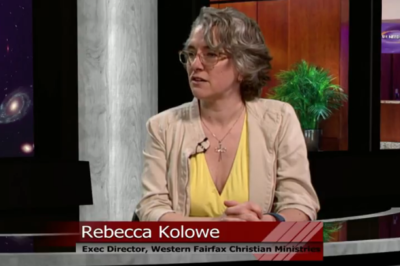 (Sept. 10, 2018) Catherine Read interviews Kelly Hebron, Esq. 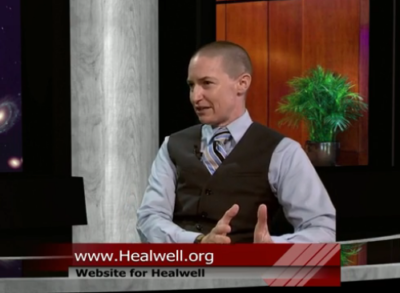 founder of From Prison to Paralegal, a recidivism reduction program that offers incarcerated individuals a path to a professional career via training to become paralegals. There are many openings in this field, with a variety of jobs that are well paying and stable. This six week training program, coupled with an internship opportunity, gives hope to individuals who are looking to forge a new path for themselves after they have paid their debt to society. The first pilot class of this program was launched this past summer at the Fairfax Adult Detention Center. After collaborating with Sheriff Stacey Kincaid, Hebron identified 8 students who would be good candidates. The students needed to have basic reading, writing and comprehension skills equivalent to an 8th grade education. After the six week training, her program is designed to teach the students how to complete legal research, use critical thinking skills to analyze the cases, and then summarize their findings with proper legal writing. Hebron mentions that even if these students do not wind up with jobs as a paralegal, the skills they are learning are transferable and can be applied to a variety of positions, such as executive assistants or court clerks. Hebron’s program is designed to be a gateway for students to move themselves forward. Her ultimate goal is to identify employers who have openings, and pair her students with the employers once the students have transitioned back into society. Before that happens, however, there are often many obstacles that these students may face. Some do not have any clothes to wear to an internship or even an interview. The student may lack resources for transportation to get to the job, especially if they do not have help from family or friends on the outside. In one instance, Sen. Tim Kaine’s office offered a full time opportunity for a work-release internship, but the candidates was restricted from traveling outside of the county so the job went unfilled. However, as the program grows and more opportunities arise, Hebron is confident that they can overcome many of these obstacles by partnering with other nonprofits who can help support the students. Hebron strongly believes that the purpose of incarceration should be rehabilitation, as opposed to a lifetime of punishment. The cold, hard reality that exists for most people when they are released from prison is that they do not have very many opportunities to turn their life around. They often have no money, no job, no voting rights and limited education. This makes it exceedingly difficult for them to secure housing, a good paying job, and the ability to take care of themselves. They often turn back to the old habits they had that put them in jail in the first place. It is the reason why the recidivism rate in this country is so high. Hebron strongly believes that education is the key to giving hope and the confidence to believe that they can make a better life for themselves. In the second segment Catherine speaks with Mohammed, a graduate of the From Prison to Paralegal program. Mohammed admits that he made some very bad choices when he was younger, and was serving his time for his crimes. He admits that there were not very many opportunities to do anything productive while in prison. When he noticed the flyer posted about the program, he spoke with his Mom who encouraged him to apply. He enjoyed the classes, which reminded him of the work he did in high school, and said that attending the classes were the highlight of his day. Upon gradation, he landed an internship opportunity with the American Civil Liberties Union ( ACLU) office. He absolutely loved going to work at their office, noting that the people he worked with were respectful, kind and warm. He never understood that work could be so enjoyable, and that working for a higher purpose could be so meaningful. Working at the ACLU has opened up his eyes to the many opportunities that await him. This program was transformative for Mohammed, and gives him hope for the future. He understands that his education cannot be taken away from him, and he envisions himself as gainfully employed once he is released. As Hebron looks ahead to the future, she is encouraged by the success that she has had in Fairfax. 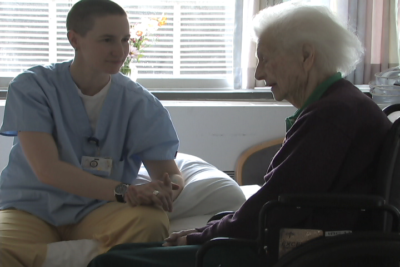 She hopes to be able to bring this program to more students in the near future. The program lives under the social enterprise umbrella of Rising Tide, designed to bring opportunities for building a variety of skill sets for incarcerated individuals. Hebron is in the process of applying for grants and securing funding in order to grow the program. If you are interested in supporting her efforts, you can visit the website for more detailed information about how to get involved. She is looking for employers who are willing to hire individuals, along with donations to support the nuts and bolts of delivering the 6-week program, including money for textbooks and instructors. Hebron envisions endless possibilities, and hopes to grow the program in order to give hope to more incarcerated individuals. 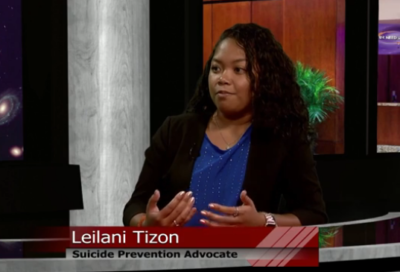 (Sept. 5, 2018) Catherine Read sits down with suicide prevention advocate Leilani Tizon to discuss her work surrounding suicide prevention and awareness. Leilani’s brother Christopher committed suicide when she was in the sixth grade, and she has spent much of her young life working to help others who are plagued by this tragedy. September is National Suicide Awareness Month, with World Suicide Prevention Day on September 10th. During this time, individuals and organizations will be drawing attention to the problem of suicide and advocating for the prevention of this terrible tragedy. As a freshman at Forest Park High School in Woodbridge, Leilani first noticed that the curriculum surrounding suicide prevention was not very robust. The students were shown a video, and when kids asked follow-up questions the teachers were not trained how to answer those questions or address the concerns. Leilani took it into her own hands to approach those in charge of creating the video, and give some feedback on what it is really like to lose a family member to suicide. As the school adjusted their programming, Leilani began to speak directly with her peers about the very difficult issue of suicide. Although it was painful and scary for her to discuss the details at first, she found value in sharing her family’s story. Her hope was that she was able to reach kids who needed extra support and be able to help them find the resources they need to get through their crises. During her junior year, WUSA-9 conducted a live interview with Leilani and hosted a live chat where she was able to answer questions from viewers. She was happy to share her story with a wider audience, and connect with more people who needed help. Unfortunately, other kids in her school were not happy that she was getting so much attention, and she began to be bullied during school. This was a very difficult time for her, which caused her to retreat and step away from the spotlight. When she moved on to college, she decided to elevate her voice again, because she knew that she could really make a difference. Suicide is quickly becoming a leading cause of death in the America. It is now the second leading cause of death in people aged 10-24 years old. The difficult thing for surviving family members to deal with is that nine out of ten times there are no specific warning signs. Suicide most often occurs when stressors exceed current coping abilities of those suffering from a mental health condition. Many surviving family and friends look back and say “what if?” when they are attempting to make sense of what happened. Leilani admits that she and her parents went through the same thing after her brother took his own life, but she learned that doing this was not going to bring him back and did not help them cope with their tragedy. In working with kids who are suffering, Leilani stresses to parents the importance of really listening to their kids. When children reach out and ask for help, it is very important to respect and trust them. Leilani runs into many parents who want to pretend that things are “just fine” and that their kids are just “going through a phase”. She stresses the importance of addressing problems head on and seeking out support and guidance, in order to ensure the health and well being of their children. Ignoring issues of depression will not make them go away. This month there will be multiple opportunities to show support and solidarity with those who have lost love ones to suicide. There are many community Out of the Darkness walks, where family members and friends can honor their loved ones and walk to raise money and awareness about suicide. Leilani’s family will participate in the walk in Washington, DC this year on October 20th at the Lincoln Memorial. There will also be many community events across the area, including a walk in Fairfax City on September 29th at 11 amth at the amphitheater at City Hall. You can visit the National Association for Suicide Prevention website to find a walk in your community. 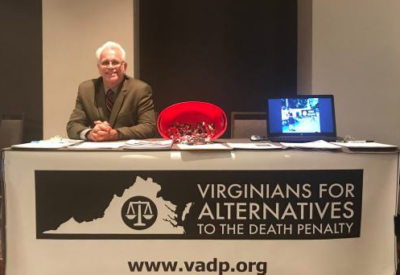 (Sept. 3, 2018) Catherine Read sits down with Dale Brumfield, Field Director for Virginians for Alternatives to the Death Penalty (VADP). Dale took over this position last year, after authoring a book about the Virginia State Penitentiary System, and penning several opinion pieces on the topic for a variety of Virginia based news publications. As field director for VADP, he seeks to engage a variety of grass roots constituent groups, from progressive to conservative to libertarian to evangelical and beyond. The death penalty has early roots in Virginia’s history. The first man to be put to death in the New World was Cpt. George Kendall, killed by firing squad in 1608 for treason. Later in 1632, the colony put the first woman to death for the crime of concealing childbirth. Since then, the death penalty has been used far and wide in the commonwealth, where over 1300 people have been executed in its 400+ year history. The practice gained popularity in the 1800’s, born from an unreliable prison system that was unable to secure its residents. Many things have changed since then, and Brumfield argues that death sentences should no longer used. However, 31 states still bring capital punishment cases to trial. Brumfield makes the case that in addition to being morally wrong (the Old Testament clearly states “Thou shall not kill” in the ten commandments), the use of the death penalty is a waste of both time and money. It costs 4-10x as much to bring a capital punishment case to trial versus a non-death penalty case. This does not even take into account the appeals process, which adds many more hundreds of thousands of dollars to the cost. When speaking with those who support the practice, one the of biggest complaints that Brumfield hears is that people do not want their tax dollars to have to pay for someone to sit in jail. They would rather have the guilty defendant put to death. In reality this is a false argument, because it actually winds up costing the state much more to bring a death penalty case to trial. Additionally, there is the cost of having the convicted felon sit on death row for what often amounts to decades. For example, in California they have had over 700 people on death row, but the state rarely executes anyone. Since 1978, when the death penalty was reinstated, the state has spent 14 billion dollars in death row costs but has only put 13 people to death. Attitudes toward the death penalty have changed significantly over the past 20 years. In 1999, 75% of those surveyed supported the use of capital punishment. Today, that number has dropped to 54%, up slightly from an all-time low of 49% in 2016, according to a Pew research study. Since 2011 there has not been one death sentence issued by a jury in Virginia, and there are currently 3 people awaiting execution. Compared to 1999 when there were 60 people on death row, Brumfield points out that the Virginia is making great strides in reducing the number of people being sent to death row. One of the main reasons that there has been such a drastic reduction in capital punishment cases can be tied to the establishment in 2004 of the Capital Defense offices. Four regional offices were opened, staffed with highly competent defense attorneys who would take on these high profile cases. In the past, many of the defendants who were poor and minority could not afford their own counsel. The court would appoint an attorney, but often times these lawyers were not equipped to handle such complex cases. The prosecution would run circles around the ill equipped court appointed attorneys, and many more death sentences were given. The establishment of these offices helped to even the playing field, causing prosecutors to drastically reduce the number of capital punishment cases that they brought to trial. Blumfield also points out that the death penalty is biased along racial lines. A research study done in Virginia showed that a person is three times as likely to be sentenced to death when the victim is white vs. when the victim is black (VJLRC study, 2000). Additionally, while African Americans represent only 13% of the overall population, they make up 42% of those on death row, and 35% of those executed. 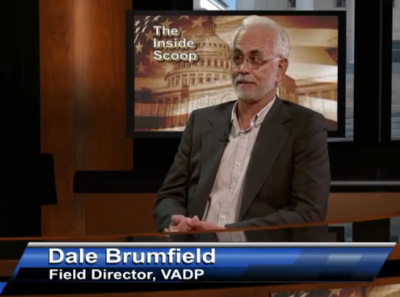 From a legislative perspective, Brumfield is working with the Virginia General Assembly on two main initiatives. The SMI bill (Severe Mental Illness) is designed to make sure that no person with an IQ of 70 or less is executed. Recently, a young man with an IQ of 56 admitted to a crime he did not commit and was given the death penalty. He was proven innocent through DNA testing, but he came within 7 days of being put to death before he was exonerated. This year, Brumfield will also be working on a bill addressing drug secrecy of the injection cocktail used for executions in Virginia. There has been quite a bit of controversy over this practice, and this bill is designed to shine a spotlight on the ingredients being used for these cases. VADP is holding a luncheon in Reston to raise funds to support their work. Joe Giarratano, a man who served 38 years for a crime he did not commit, will be an honored guest. Actor Mike Farrell (better known as B.J. Hunnicutt on MASH) will be the keynote speaker. For over 30 years he has been working in California to abolish the death penalty. Details and signup information can be found on their website.